Fully Automatic PLC based On-line Multi-Head (6 tracks) Hot Roll Rotary Coder Model HRC – 300 – O with blue Digital LCD display, soft touch keys & production counter. 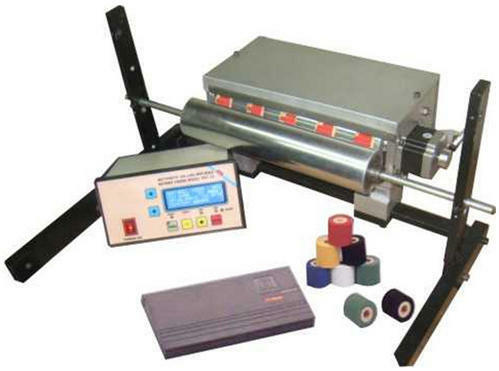 This coder (equivalent to MARKEM coders) uses instant dry hot wax ink roller and easily changeable flat type rubber / nylon stereos for simultaneous 6 tracks of smudge free printing of 4 to 6 lines of size 25 X 70 mm & speed upto 200 packets per min. (Free accessories include 2 mm Flat Rubber Character Set, Hot Wax Ink Cartridges & Print Sensor). This type of coder is suited for Multi-track continuous FFS (Form Fill Seal), flow wrapping, blister pack machines, winder-rewinder system, etc. Instant dry thermo-fusible hot wax ink roll. Appx. 1,00,000 per 32-mm. replaceable cartridge.